Letterforms and birds are subjects that frequently turn up in my journals. At first, I simply matched bold words with their subjects, but more recently, I’ve tried to get birds to perch on letters. It’s not always easy to do. You’ve got to know a bit about the anatomy of bird feet, and find the right placement to support the bird and balance the page. 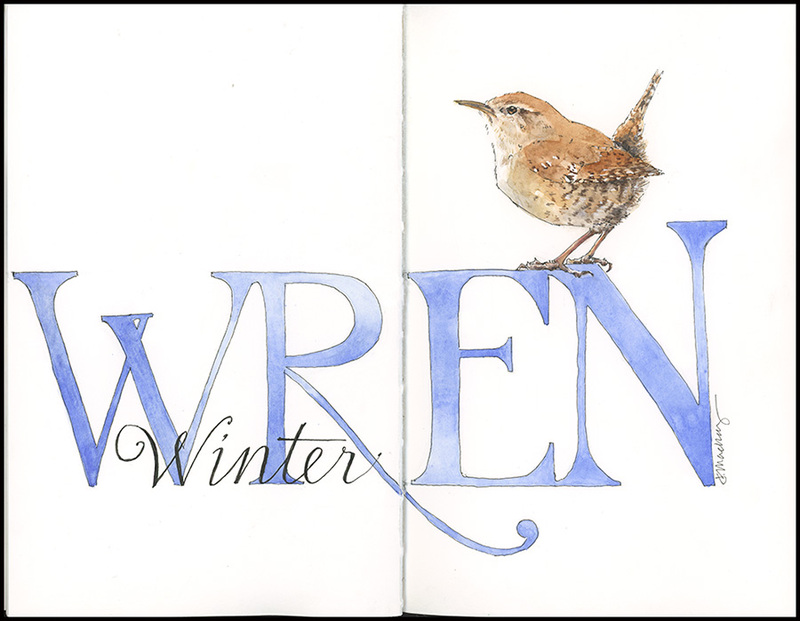 Here’s a fun one that I did today— the lovely winter wren. Here are a few sketches and paintings that give a sense of my progression with this over the years. Tips and Techniques– Don’t shy away from learning to draw birds’ feet. You know you’re guilty if you are prone to hide this part of a bird’s anatomy behind leaves and branches. A simple Google search for “bird feet anatomy” will turn up lots of good diagrams and drawings for you to study and practice. If you have an opportunity to look at bird skins or mounted birds at a nature center or museum, take the time to sketch feet. It’s a sure way to improve your bird art. Small in stature, but with an exuberant song that makes up for it, the winter wren is more frequently heard than seen. The song always surprises me— warbled and sweet, it goes on and on, ringing through deep, moist northern forests in Maine where I hear it each summer*. I went to the Yale Peabody Museum of Natural History in New Haven for a reference for the winter wren. On display in its ornithology collection are five species of North American wrens. None is very large, but the winter wren is astoundingly tiny— only about 3-4 inches (8 cm). I much prefer drawing and painting from specimens than photographs, as there is much finer detail to see in the feather pattern and color. 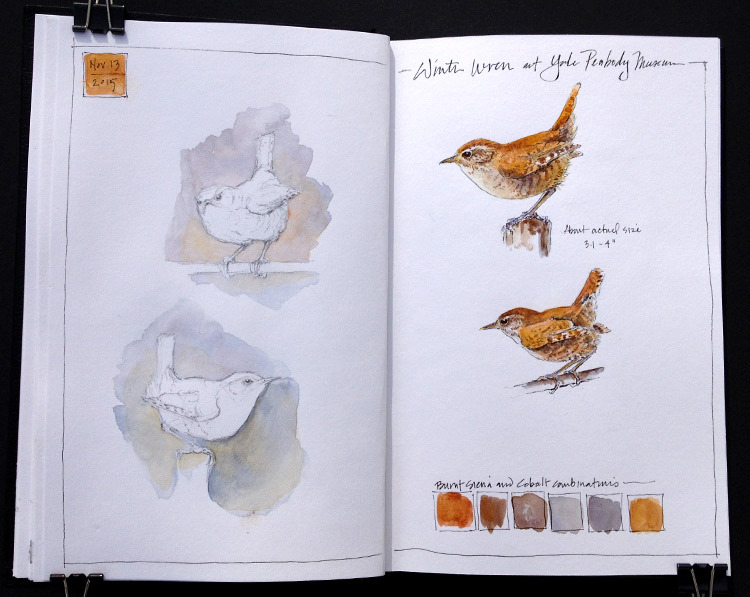 I also watched a couple of videos of winter wrens and looked at different images of the bird, so that I had more than a single reference for the final piece. *ARTS AND BIRDING, 2016, Registration Open! 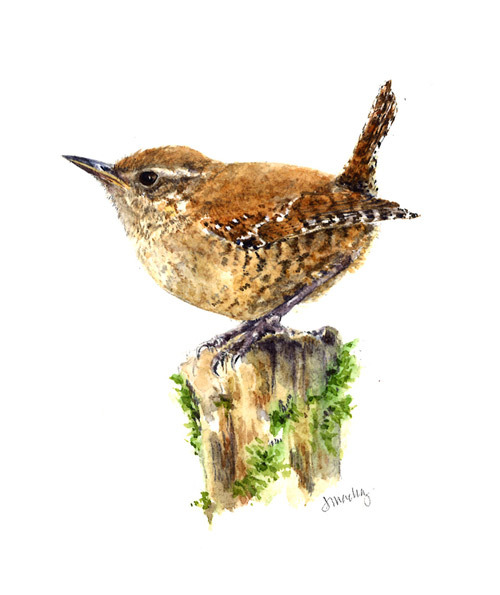 You can hear the beautiful song of the winter wren, along with the calls of puffins, terns, gulls, and the gentle lapping of waves on rocky shore during Arts and Birding, 2016. I’m heading up a 5-day session for artists and photographers July 10-15, 2016. Get details on my Workshop page or on the Hog Island website.